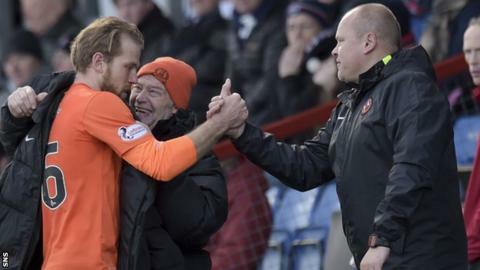 Mixu Paatelainen insists that he is only a "small part" in the turnaround in Dundee United's form that has led to him being named manager of the month. United midfielder Paul Paton was also named top player in the Scottish Premiership during February. "I'm just a small part of it," said Paatelainen. "Ultimately, it is the players who do the work on the pitch and are the most important people. "We had a relatively good month. Everybody put the effort in." United are still eight points behind Kilmarnock at the foot of the Premiership despite a month during which they won three and drew one of their five matches. Paatelainen conceded that it is not too often that teams at the bottom end of the league receive such awards. 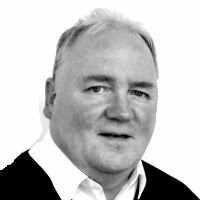 Dave MacDonald of sponsor Ladbrokes: "Every month, we bring the sports media together to discuss the managers and players that have shown these qualities across all four sponsored leagues. When looking at a manager's performance, there are many areas that help the sports media come to these decisions, home and away form, the quality of the competition they have come up against, scoreline, tactical performances and goals for and against. When it comes to individual performances, similar attributes are taken onboard, together with goals scored and assisted goals. Mixu Paatelainen was voted manager of the month for February after excelling against Hearts at home and Ross County in Dingwall and, coupled with February's form, the sports media deemed these performances worthy of recognition." United won seven points during February - the same as leaders Celtic and second-top Aberdeen - and the awards panel felt that, considering United's lowly league position, the Finn was a worthy winner. "Obviously it's a sign that last month we did well and hopefully we can carry that on," he said following another fine result - Saturday's 3-2 Scottish Cup quarter-final victory away to Premiership rivals Ross County. Paatelainan also spoke highly of Paton and the effect such an award would have on the rest of the squad. "Massive boost," suggested Paatelainen. "Paul is a leader, he is a full-hearted player, leads verbally, leads by example and a wonderful player to have in your squad as he always gives 100%. "He is a prime example of how the ball-winners do the so-called dirty work in winning the ball and doing the job for the creative players."